A double take might be necessary with this jewelry travel case. Not only is the Zoe cute, but it’s super useful—with a mesh flap for your earrings, a ring holder, and a velvet pillow cushion that keeps necklaces, watches, and bracelets untangled. You’ll be surprised at how much you can fit when your case is organized. It’ll add a touch of smart style to your day-to-day. Dimensions: 5.5" x 4" x 2.5"
I would love to see one larger for the more stationary home setting! Perfect for long weekend adventures! We like these jewelry and cosmetic travel cases inside and out. Not only did Maker Christina Oh design them to be beautiful—she paid pragmatic attention to detail and kept your routines in mind. We were so impressed when we used them, happily saving on time and effort when getting ready. Each case looks sophisticated and feels lovely, made from vibrant canvas, embossed with a vegetable tanned leather trim. And that beautiful outside opens up to a highly functional interior. Pack the Delilah on your next trip. It’ll separate your cosmetics and toiletries into four detachable, see-through pouches. And it even has a hook so you can hang it and free up sink space. The Zoe is your go-to stop for jewelry—with a mesh flap for your earrings, a ring holder, and a velvet pillow cushion that keeps necklaces untangled. 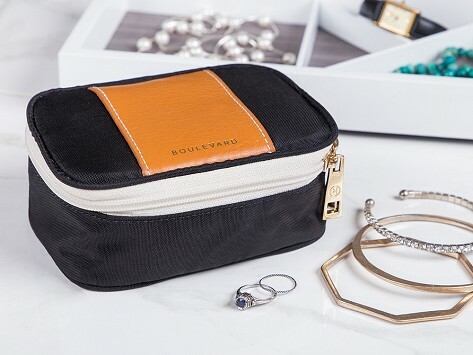 Even Boulevard’s classic makeup case, the Megan, gives you easier access (no more digging around in your makeup bag) and adds a sophisticated touch to your daily routine. 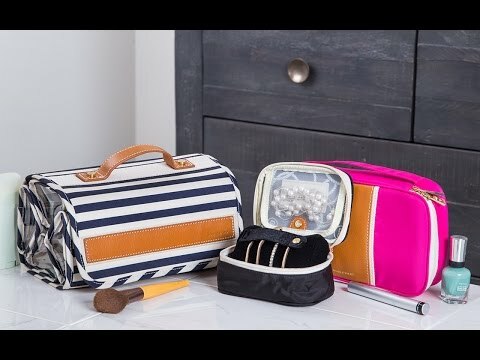 The classic, timeless designs will keep your morning routine or out of town trips easier and more organized.